21Jan 2018, replacing one issued 22Jan2017 -- Let's change it every year, that will make us profitable! http://pe.usps.com/text/dmm300/Notice123.htm (same document, but in webpage format, not PortableDocumentFormat). Get a PayPal account for the cheaper prices below, buy your label online, avoid the Post Office lines. 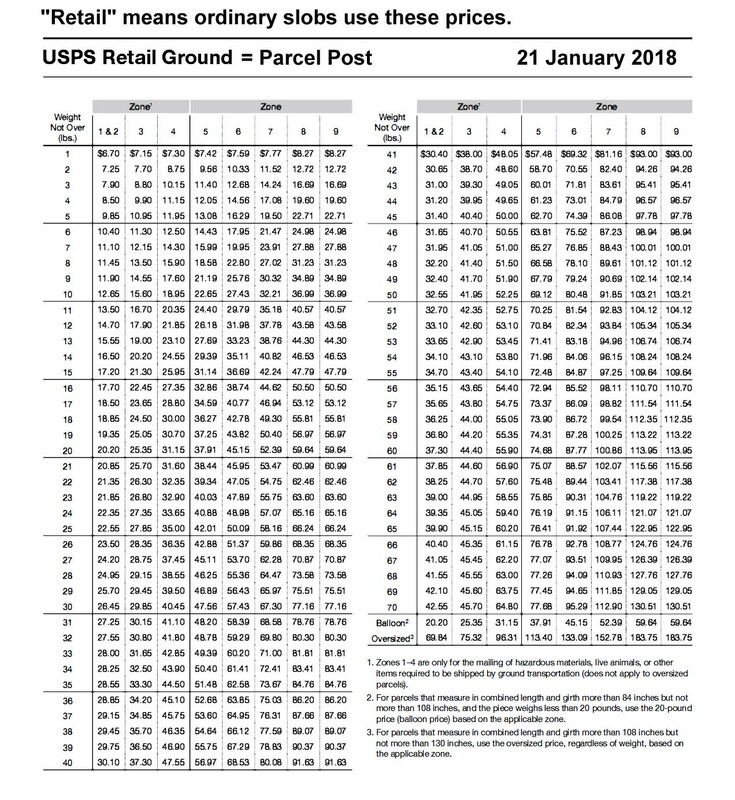 I once tried to figure out how commercial Parcel rates are calculated when items are taken to Bulk Mail Center (BMC) and Auxiliary Service Facilities (ASFs). These are the mail sorting centers Congress wants to shut down to "save money". The Congressmen shutting them down want to help us "save the Postal System from financial collapse." When a facility is closed down, employees are thrown out of work, and the postal executives get a bonus (society rewards them for good leadership). Once enough of the sorting centers are gone, the Post Office will never again be able to deliver first class mail by the next day. Delivering an ordinary envelope the next day and "overnight delivery" from corporations like FedEx are not much different, except that one costs $21.05 to $36.05 ("FedEx Envelope" up to 8 oz, 2013) and the other costs 89 cents (3 oz First Class business envelope 2016). Private industry can beat any competitor once we use a corrupt system to destroy in our time what previous generations had built for us. Revised 1February2018 Where did January go?